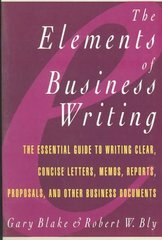 Elements of Business Writing 1 Edition From an interoffice memo to a fifty-page proposal, this is the definitive guide to business writing. Anyone who has ever had to write any business document will find "The Elements of Business Writing" the single most effective tool for producing clear, concise, and persuasive prose. Equally useful to executives and support staff, it shows how to: write clearly and powerfully; rid writing of jargon and pompous language; organize material effectively; and avoid errors in spelling, grammar, and usage.